Another question I’m often asked is how I organise my collection. 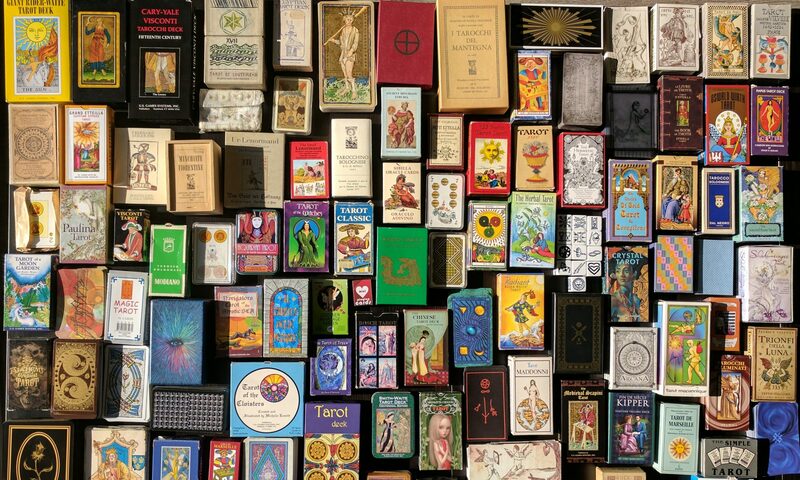 I have stored my decks in a number of different ways as my collection slowly grew from two tarot decks to the current 149 decks. Initially, I just kept them on my desk. That’s clearly no longer an option, I’d need a significantly larger desk! The next stage was on a shelf in no particular order. When I reached about 25 decks, I bought a wooden carry box from Ikea, and packed the decks in however the fit best. I liked being able to pick up my entire collection and take it with me places. I added a second box when I could no longer fit all my decks into one, but I outgrew that as well. 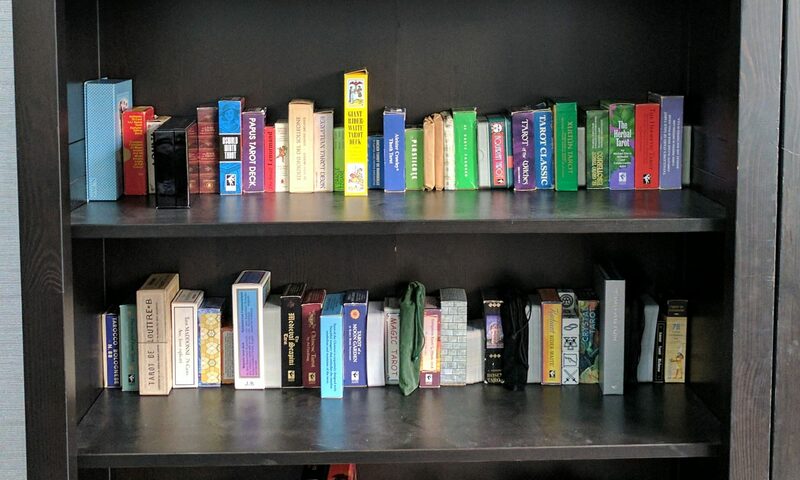 I still use the carry boxes to carry some of my decks, but I ended up storing them on a bookcase at home. The collection currently fills five shelves, but there’s plenty of space to expand into, and I can double up if I run out of shelf space. That covers where the decks belong, but I still had to figure out how to organise them. When they were in the carry cases it was a matter of fitting similar sized decks next to each other and filling in the gaps with whichever decks fit, but now that I have a whole bookcase to fill, I wanted to organise them in a way that made it easier for me to find particular decks more easily. I decided to arrange them by date, rather than by type of deck or size, which might have been a bit neater looking. I have a lot of historical decks and the dates range from circa 1450 up to the present, so sorting them by date is useful. Some decks are a bit difficult to date, historic decks tend to have rough estimates rather than fixed dates, but it’s generally easy enough to put them in chronological order. Some decks are a bit more difficult to decide what to do with because they’re a version of an old deck but they’ve been updated or changed, so there’s the date of the original deck and the date the new version was published to choose between. I usually go with the original date if it’s a restoration or reproduction and the published date if the deck has been revamped. If I have more than one version of a deck, like the Visconti Sforza or the Rider Waite Smith, I order them by the date I acquired the deck. Similarly if I have more than one deck released in the same year, which happens a lot with newer decks. If I get two decks released in the same year on the same day (yes, this has happened!) then they go alphabetically. To keep track of where each deck belongs and where new decks need to slot in, I keep a spreadsheet of the decks. This is also handy if I’m looking at a bargain deck and can’t remember whether I already have it (this doesn’t happen often, I’m usually pretty good at remembering). I got my first tarot decks in around 2009. I was living in Toronto at the time, and I remember that I got them from The World’s Biggest Bookstore, which was a pretty big bookstore, unsurprisingly. I don’t remember which deck I got first, or even whether I got them at the same time or not, but I do remember the process of choosing which deck to get. I can’t remember why I decided to get a tarot deck in the first place, but I had been interested in paganism and wicca at the time and was reading all about those online, so I suppose I must have become interested in tarot along with that. 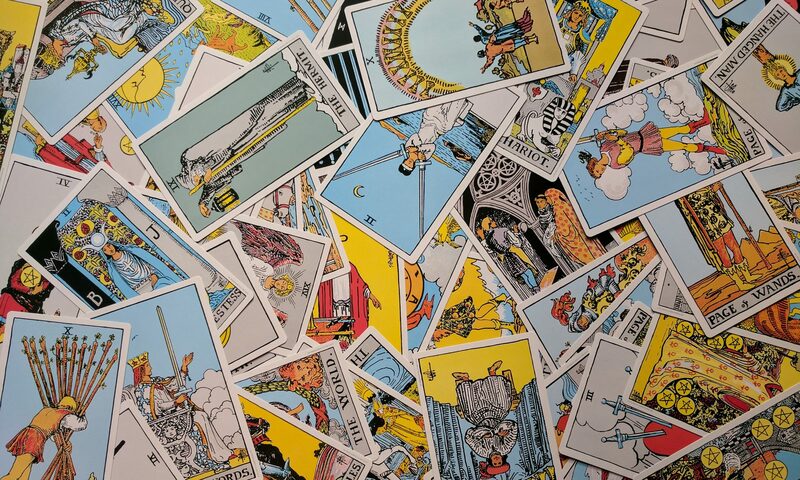 Once I had decided to get a deck, I came across Aeclectic Tarot and quickly realised that there was a huge number of decks to choose from. 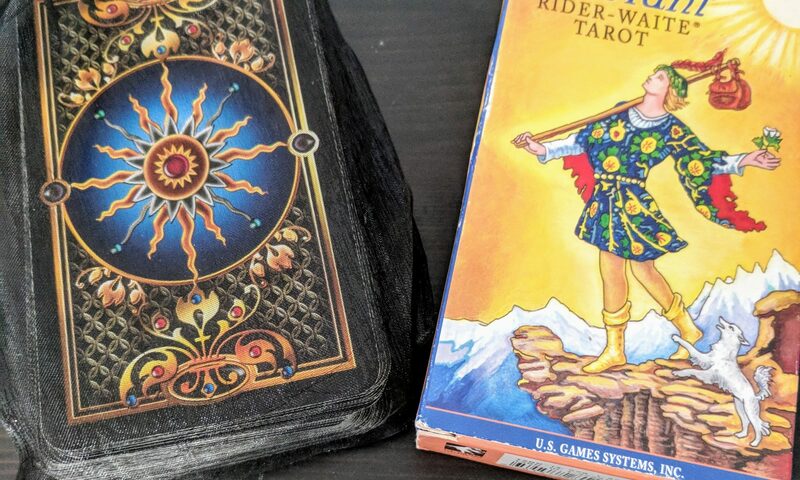 I did some more reading and research online, and decided that I should get a deck that I really liked, and also a Rider Waite deck because it seemed to be the one that all the books were talking about, so I thought it would be helpful to learn the card meanings and symbolism. I really didn’t like the look of the Rider Waite though, which seems like a strange thing to say because it’s come to be one of my favourite decks. I looked at a bunch of images of different cards from different versions of the Rider Waite, and eventually settled on the Radiant Rider-Waite which is more colourful I thought was less ugly. The other deck I chose was purely based on the pretty pictures I found online. I looked through a lot of the categories on Aeclectic, anything that sounded reasonably interesting, and checked out the card images for any deck that I thought I might like. I settled on the Gilded Tarot by Ciro Marchetti. Around the same time, I also picked up Rachel Pollack’s Seventy-Eight Degrees of Wisdom, which I think I also discovered through Aeclectic Tarot, on the forums. Possibly because Aeclectic was my introduction to the world of tarot decks, I had my eye on a few more decks right from the beginning. Over the next five years I added the next six decks to my collection (Osho Zen, Thoth, Alchemy 1977, Tarot Nova, Quest Tarot and a Harry Potter tarot) and gradually became more and more interested in tarot and different deck styles. In November 2015, I bought my first Lenormand deck to see what it was like, another Ciro Marchetti deck, the Gilded Lenormand, and I started buying tarot decks more often. In 2016 I got 72 more decks, including more cartomancy style decks as well as a lot of tarot. My other half may be pleased to know that so far this year I’ve only added 44 decks to my collection. He might not though, he thinks I already have way too many :-/.